This isl the tale of a little Rock Island church that, like a young child, just couldn’t sit still. The story begins on December 3, 1905, when a new Baptist congregation with 41 charter members was organized to serve eastern Rock Island and western Moline. 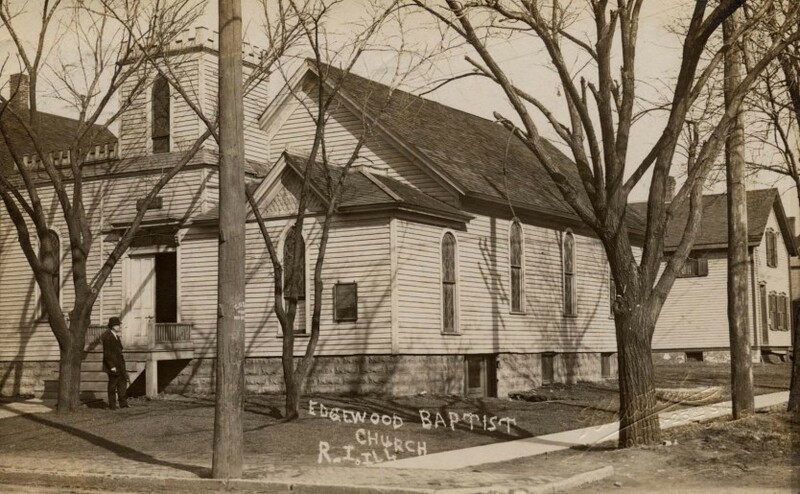 A few days later, a name for the new church was selected: Edgewood Baptist Church. Their name derived from developer E.S. Guyer’s 1888 plat for the Edgewood Park subdivision, which was located a few blocks south of the first church. It was intended to be the start of a brand new town between Rock Island and Moline. The congregation, with its first pastor Rev. H. B. Hazen, met at 447 44th Street in a building which had first been used in the late 1890s by Emanuel (or Immanuel) Baptist Church. In 1907, the Edgewood congregation voted to move the building to a more prominent corner location across the street, at 4325 5th Avenue. After the modest church was picked up and moved, it was enlarged as well, with a bell tower addition and an enclosed front entrance. This Real Photo postcard, from the Special Collections at the Augustana College Library, shows the church as it appeared after this move. We can date the postcard to about 1912 by the very light signature in the lower right hand corner that says “Bartsch 412 23rd Street.” Frederic J. Bartsch operated his photography studio at that location for several years. The pictures shows a simple gable-roofed building with clapboarded walls. The round-topped and Gothic-pointed windows immediately identify it as a church, even to the casual observer. Enlarging the photo reveals that the windows are stained glass in a geometric pattern. The top of the bell tower has ornate “crenellated” trim and the new foundation is tall, to permit a high basement ceiling. You can see the basement is concrete block, as the same imitation stone texture is seen on each piece. The sidewalk on the front, 5th Avenue side, is brick, while that on the 44th Street side is concrete. The surroundings could be any residential neighborhood in Rock Island, with 1 ½ and 2-story homes in the background and tree-lined streets. Today that location is unrecognizable. It became one of the most important industrial centers of Rock Island when International Harvester built a huge manufacturing facility here. The first church site is now a parking lot and the postcard site is occupied by a huge building with a monolithic buff brick façade, formerly IH and now housing the Quad City Industrial Center. But no problem ….the church moved out before IH moved in. Yes, once again, the church building itself was picked up and moved, this time to a location that really was in the Edgewood Park subdivision. Horse drawn equipment hauled the little church south down 44th Street, across the railroad tracks, and then another two blocks before finally coming to its resting place. The new site was at the rear of a corner lot that the congregation had purchased in 1925. The front of the lot faced 8th Avenue and held a 2-story frame house. Although the address of the church continued to be that of the house, 4329 8th Avenue, the church building actually faced 44th Street and was adjacent to the alley behind the house. Soon after the move, the church received a new stucco exterior. The nearby house was joined to the church by a narrow addition and served as an annex. In ensuing years other expansions masked the appearance of the early church. The congregation later purchased additional houses on 7th and 8th Avenues for use as parsonages, parking, and potential future expansion. But the future expansion took place elsewhere in Rock Island. Although the congregation had purchased five acres within the new hilltop Carriage Place addition in 1967, it was not until 1973 that erection of a 23,500 square foot church was begun at 2704 38th Street. A year later, after the new church was dedicated and occupied, the old building was sold to the Rock Island Lions Club. It is still their home. As for the new Edgewood church – it has been enlarged over the years with the addition of a multipurpose room and remodeled entrance hall, library and offices. The little church has indeed grown and matured – and hopefully settled down. Can you imagine the sight of this big church moving along 38th Street! This article, by Diane Oestreich, is slightly modified from the original, which appeared in the Rock Island Argus and Moline Dispatch on March 7, 2004.